The Southwest Through Wide Brown Eyes: Let Me Guide You Through Canyonlands Needles..
Let Me Guide You Through Canyonlands Needles.. So here is my part two of visiting Canyonlands - Needles District in the winter; still saying "that's crazy!?!" During the day, dependent on the month, the temperatures are 50s to 70s; at night is when the cold seriously creeps in with the night sky. If staying in the nearest town, Monticello, there are several hotels and motels to hide in at night; RV campgrounds with full hookups too. Then there is Canyonlands Lodging which does offer the use of their beautiful cabins year round; or the Runnin' Iron Inn and Line Camp Steakhouse. Still confused on what to do; check out Tripadvisor: https://www.tripadvisor.com/ for reviews that will help you make your best decisions. Enough with advertising (and I don't even get paid for doing it!!! ), after that short hike at the Roadside Ruin ( http://www.southwestbrowneyes.com/2017/06/an-easy-hike-in-canyonlands-needles.html ), the very next pull-in was to view Woodenshoe Arch. Put the imagination cap on and yes, it does look like one of those wooden shoes associated with Holland. This is also where you'll get your first viewing of the Needles themselves. Hint, you have to be in the park between 8am to 11am to get the best lighting for viewing and photographing the Needles. After 11am, the sun begins traveling overhead and west, so the Needles become covered in haze. 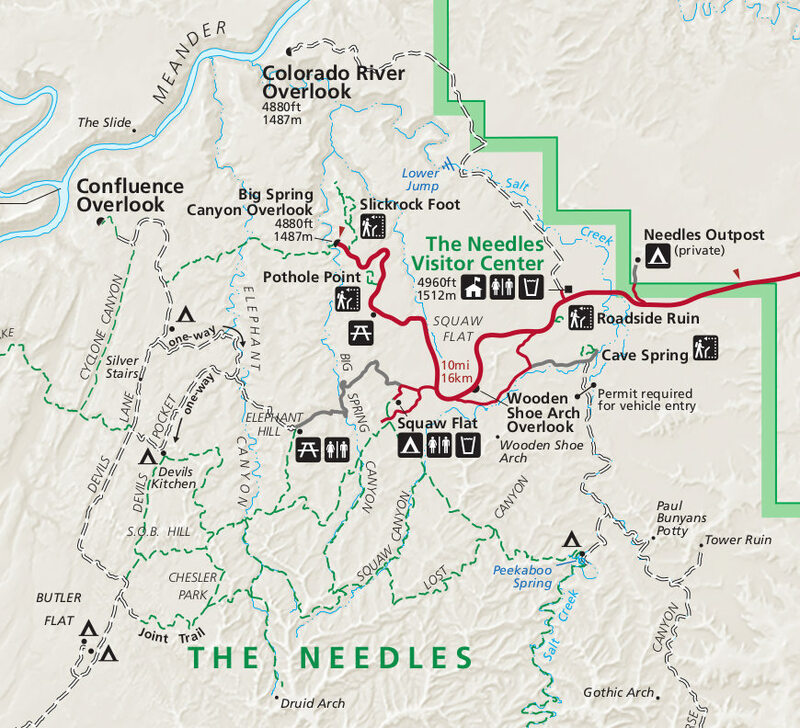 Here is where I'm going to be really nice to all my readers...a map of Canyonlands - Needles; in winter, the visitor center inside the park is closed, so you can't get a map. See the red line on the map, that indicates the paved section of roadway through the park. If you still think you need help, or are lost, stop at the Canyon Country Discovery Center at the northern end of Monticello (just before you enter the City limits on Highway 191) for more information. By the way, the National Parks (Canyonlands, Arches) do not have stores, so make sure, before beginning the journey, fill up the gas tank, have plenty of water (3-4 quarts per person; double that if long hikes are planned for), healthy protein snacks and ALWAYS take a picnic! If traveling with person(s) that have walking restrictions, Route 211 has loads he/she/they can see along the way; and Needles will offer them some great sightseeing too! Now you can understand why I worked for over four years at the Monticello Welcome Center; I know this stuff and made sure visitors were aware! We continued on the paved roadway towards Big Spring Canyon Overlook, but first stopped at the pull-in area for the Slickrock Foot Trail. We didn't walk that trail as we were too interested in what we spied on the other side of the roadway. That shouldn't mean that you don't do the trail; Roy and I just happen to enjoy doing "Oooo, bunny" stuff; you know, "Oooo, what's over there?" or "Oooo, where does that road go?" Looking upwards, I spotted an opening and thought it was either a cave, or an arch; inside though, looks like there's a ruin there (ancient or modern I don't know). One thing I always enjoy is photographing plant life, wild life and desert landscape...it's like being on another world!. ...and for some reason, Roy enjoys photographing me, photographing. Looking across, you can make out Big Spring Canyon Overlook. Just a short drive down to the next pull-in area, welcome to Big Spring Canyon! ,,,and Roy taking my photo, so I took his too. Next stop, Elephant Hill Road; the Needles can be seen here too (one mile along road - graded to make passenger car accessible), but, again, the haze makes it difficult to see the layers of coloring. Reaching the parking area, there are actually two trails; 4 Wheel Drive is rated one of the most extreme in Utah, and the hiking trail. We didn't drive the 4WD trail, but walked the first 1/4 of a mile and even that was a bit on the nerve wracking side; had to pay attention to avoid a fall, spraining or even breaking something. It starts out easy on dirt, and then quickly switches to uneven rock! Wait till you see the views from the point we stopped walking. It's around 4:30pm and time to head on back to Monticello, as the sunset will begin soon enough (remember, this was February 2017). Time enough to take a quick photo of the hiking trail before we go. Hope you enjoyed our winter journey through Canyonlands - The Needles District. See, there's lots to do in the desert parks...in winter! Fantastic photos of an amazing place! They were even better when enlarged. Just wanna say I've been looking at your block for more than a year, making my way through all the posts. I was in Monticello a couple years back. I'll be coming through again in the spring, I think. Anyway. Love your blog. Don't stop. I'm in Maine and it's great to see the desert through the eyes of a sensible person. Thank you so much! I'm at Canyon Country Discovery Center now, so when in town, and the place is open, stop on in and say hello!